Ball Quest for MSX. Previously released on ZX-Spectrum, this tricky dexterity-platform game will keep you entertained for hours on end. The goal is to guide a bouncing ball through a course of floating platforms, collecting items and evading the bad guys as you go. An interactive megademo with filled vectorgraphics, a tubescroller, interference, morphing, water, a rotamapper, fire and bumpmapping. Moonsound required. Infinite's entry for the MEGA Challenge. Montana John is a platform adventure which combines game play from The Goonies and Usas. 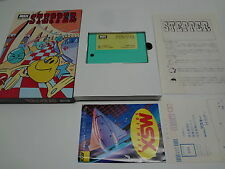 The game is an MSX2 SCC Megarom, but will also work on an MSX1 with 64KB or on an MSX1 with 64KB and a V9938. First person (3-dimensional) adventure in 64x48 pixels. MSX1 and higher, 32KB RAM and 16KB VRAM. Game and PDF manual are available in English and Spanish. Point 'n Shoot game for MSX2 and higher. Game and PDF manual are available in English and Spanish. Requires 64KB RAM and 128KB VRAM. Mouse and Joystick are optional. Raytrace demo in 64x48 pixels. Requires MSX2 or higher, 32K RAM and 128KB VRAM. English and Spanish manuals are provided. 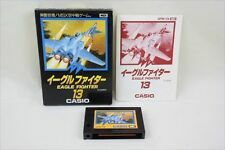 Point 'n Shoot game for MSX2 or higher. Requires 128KB RAM and 128KB VRAM. Joystick or Mouse are optional, PDF manuals are provided in English and Spanish. John Hassink's 64x48 entry for the MEGA challenge, a vertical shooter with multilayers! 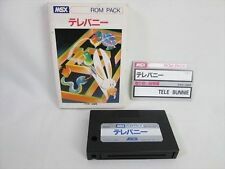 For MSX2 with FM-PAC. A 64x48 MEGA Challenge entry from XL2s using screen 3 (which is a 64x48 screen). A horizontal shooter inside a motion-blur / frame-fade engine! Requirements: turbo-R and SCC.